I haven't been that busy, really.. I was gone on a trip but that's not a good excuse. I've just been uninspired. Generally feeling LOST everyday. Unsure of where I'm going with this blog, with my creative endeavors, with my life. Yup, it's not a great feeling. After seeing Sally at Shim and Sons (here) and Sarah at The Small Object (here) whipping jersey scarves, I had to try it myself. I got one yard of this starry fabric at Jo-Ann Fabrics, cut it into two strips, and hand-stitched the ends of each strip together to loops. Oh, I lied. I made TWO scarves. Not too shabby for less than $5! 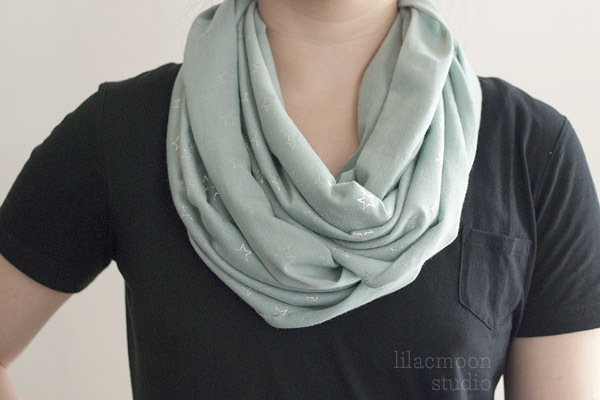 And I love how these infinite loopy scarves don't fall off your neck. Brilliant. Just loop it!